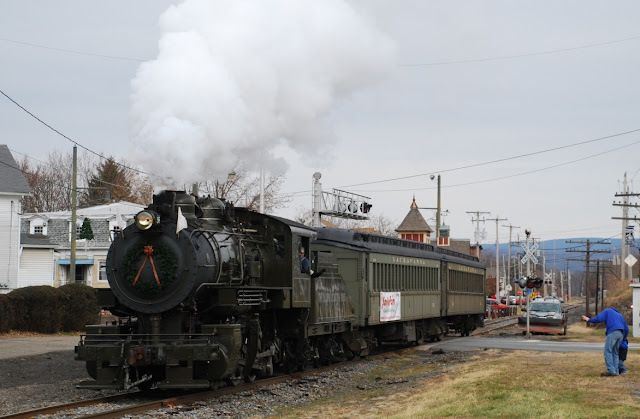 Help us bring the train back to Lambertville with your year-end donation to BRRHT! 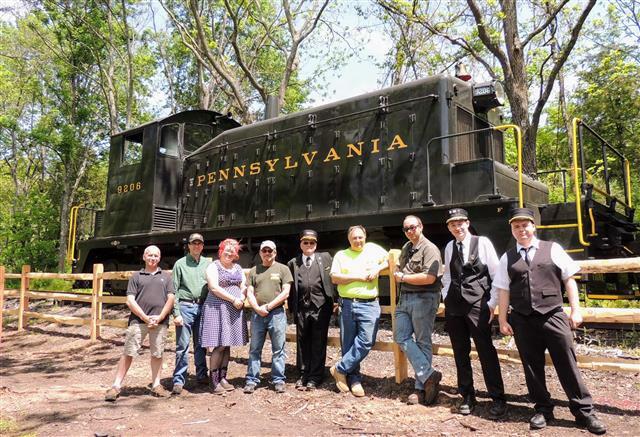 Time is almost up to make tax-deductible donations in 2017, so please consider making a donation to BRRHT (a 501(c)(3) not-for-profit corp) in support of our project to bring the train back to Lambertville! We have already opened 2.5 miles of the line, and have 4.5 miles left. With your support, we may complete up to another 2-3 miles in 2018! A private donor will be matching 25% of all donations through the end of 2017, so your donation can have an even bigger impact! A holiday toast for one and all this holiday season! When Air Products transported their heat exchangers down the Lehigh Line here in NJ, one observation was how it looked like a giant bottle. Perhaps this photo is wishful thinking but the sentiments shown in that scene is a toast to all my friends and their families for good health and happiness during this holiday season and into the new year! NS will not accept trains at interchange from 7:00 a.m., Sunday, December 24th through 10:00 p.m., Monday, December 25th. NS operations will cease at 3:00 p.m., Sunday, December 24 through 10:00 p.m., Monday, December 25th. This includes road trains, yard switchers, and local trains servicing customers. 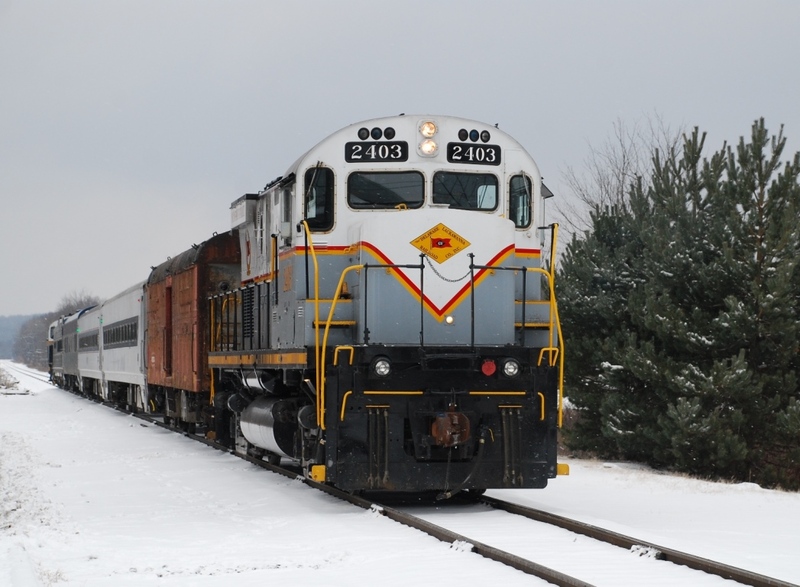 NS road operations will run as regularly scheduled over the New Year’s holiday. Yard/local operations will operate as governed by volumes and customer needs. 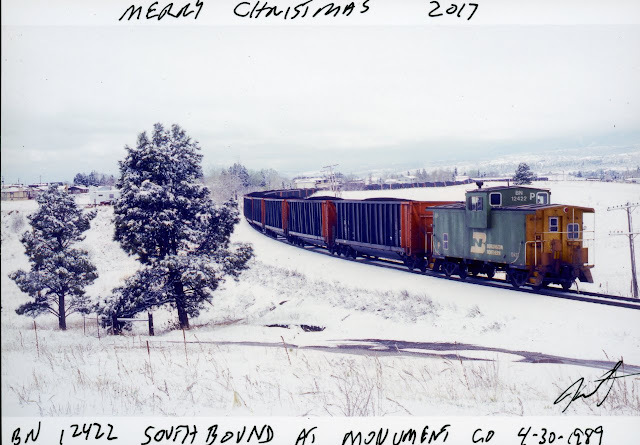 Customers with critical service needs for either holiday should contact their respective OSS, Automotive, Intermodal, or Unit Train Representative. CASTILE, N.Y., Dec. 11, 2017 – After two years of construction across a 235-foot-deep river gorge in Letchworth State Park, Norfolk Southern has begun operating trains across the new Portageville Bridge on its Southern Tier Line. Known regionally as the Portage Bridge, the 963-foot-long steel arch railroad span will support economic growth and jobs across New York’s Southern Tier region, connecting businesses from Buffalo to Albany with markets east and west. The new bridge will speed up train traffic and enable Norfolk Southern to run heavier rail car loads over the line, eliminating a major rail bottleneck for freight shippers. The $75-million single-track bridge, which spans the Genesee River Gorge, was funded through a public-private partnership among Norfolk Southern, the New York State Department of Transportation, and the Federal Highway Administration. At 2:20 p.m. Monday, Norfolk Southern’s 36T, an eastbound general merchandise train running from Buffalo to Allentown, Pa., with stops in Corning and Binghamton, N.Y., became the first to run across the new bridge. In addition to enhancing rail safety and operating efficiencies, the new bridge expands freight capacity and business opportunities for shippers from the Midwest to New England. With the new bridge, Norfolk Southern can now transport rail cars over the Southern Tier Line loaded to the industry standard 286,000 pounds, a key benefit for customers. The old iron truss bridge it replaces, built in 1875 by the Erie Railroad, was unable to support modern freight rail needs – car weights had to be reduced 13,000 pounds below the standard, while train speed was restricted to 10 mph. Trains crossing the new bridge will operate at up to 30 mph. Among New York-based businesses benefitting from the new bridge are 10 short line railroads that service and connect local industries to Norfolk Southern’s network. Norfolk Southern transports freight over the Southern Tier Line for about 1,100 customers in more than 20 states. 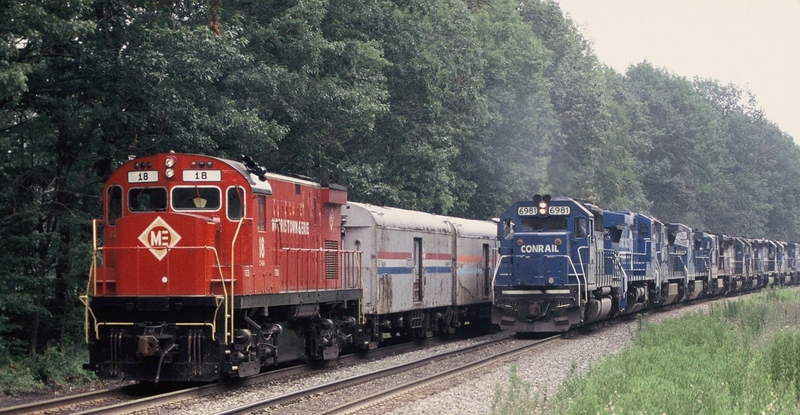 The line serves as a gateway for trade with Canada and provides a connection to New York City and New England markets. The design and construction budget for the bridge project included $15.5 million provided through New York State, including a $2 million grant from the Finger Lakes Regional Economic Development Council and $13.5 million in state and federal funds through the New York State Department of Transportation; and $59.5 million from Norfolk Southern. The bridge’s arch design minimizes the railroad’s environmental footprint in the Genesee River Gorge and complements the scenic vistas found in Letchworth State Park. Actually the train ride, sponsored by the Erie Lackawanna Dining Car Preservation Society (ELDCPS), was to Gouldsboro (PA) on December 10th. Saturday's four inches of snow and sunshine made a nice touch to what amounted to being a pleasant ride through the Poconos. 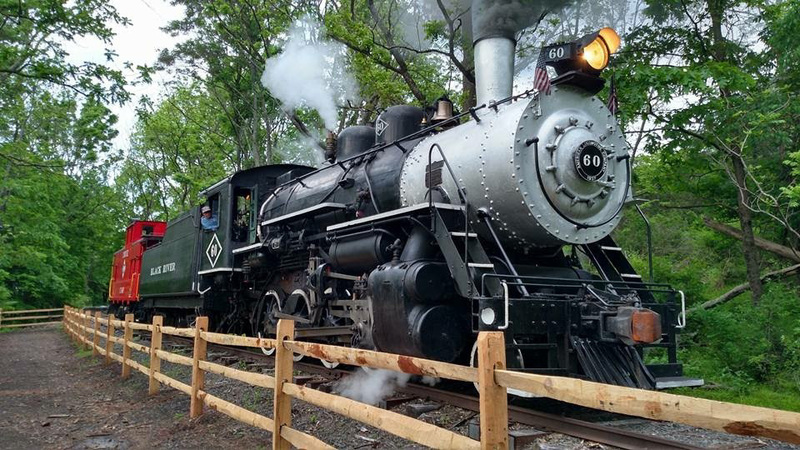 The ride was described as follows " The train will stop at the historic Gouldsboro station for everyone to have the opportunity to explore the restored station. 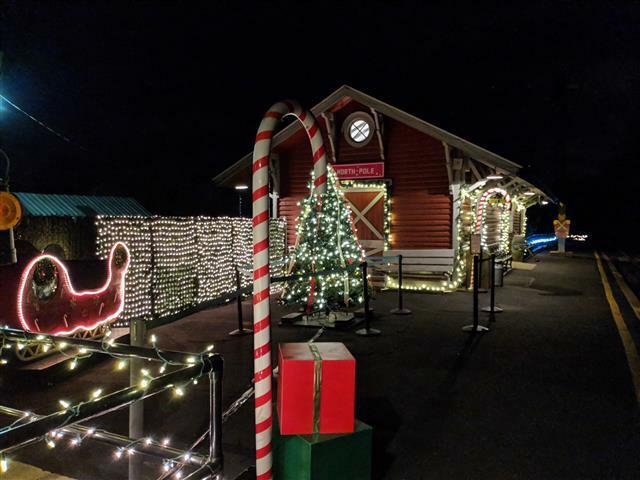 At the station, passengers will enter the Dickensian world of A Christmas Carol with volunteers dressed in period-authentic costumes, featuring stories, caroling, and a visit from Santa, Scrooge, and his ghostly visitors." Passing over the grade crossing in Tobyhanna I recalled that was the crossing I bicycled over in my NJ to Wyoming bike trip on a day that was hot and humid. The Goldsboro Area Foundation proved to be very good hosts at the station with their various home made goodies. At 3:30 it was time to depart for the trip back to East Stroudsburg. Our train was held for about twenty minutes around Mount Pocono for a northbound DL freight. Once that train passed we were once again heading for East Stroudsburg. All in all, it was a nice day on a trip that was well run. Image 1: Passengers getting ready to board in East Stroudsburg for the 1 PM departure. Motive power for this trip was DL 2403 and DL 2423. 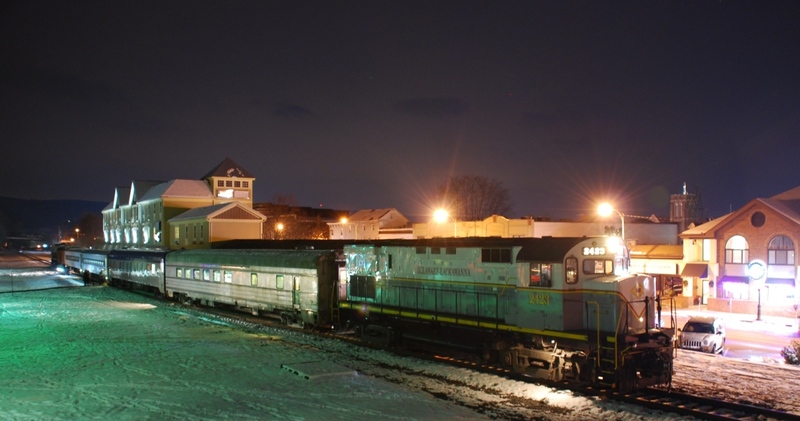 Image 2: The Christmas Train awaits its passengers to board in Gouldsboro for the return trip to East Stroudsburg. Image 3: I was tempted to try an existing light photo and the Christmas Train's evening return provided me that opportunity. My location for this scene was the porch on the East Stroudsburg Tower and for a "stand" I used the tower's wooden railing. Mars Wrigley Confectionery, maker of M&M’s, this week announced plans to locate its U.S. headquarters to the former Newark Warehouse Company, opened in 1907 as a rail-served facility by the Central Railroad of New Jersey in the heart of the city’s business district. The company, with offices in Chicago and Hackettstown, N.J., will locate about 500 jobs in the structure, to be renovated as part of Ironside Newark, a 456,000-square foot commerce and retail center. North Pole Express Departures Added For Dec 23! Two North Pole Express Departures Added! That's right! Due to overwhelming demand, we have added two departures to our 2017 North Pole Express schedule. Both trains depart Flemington Station and will be powered by one of our diesel-electric locomotives. Tickets now available! Click Here For Details & Tickets! 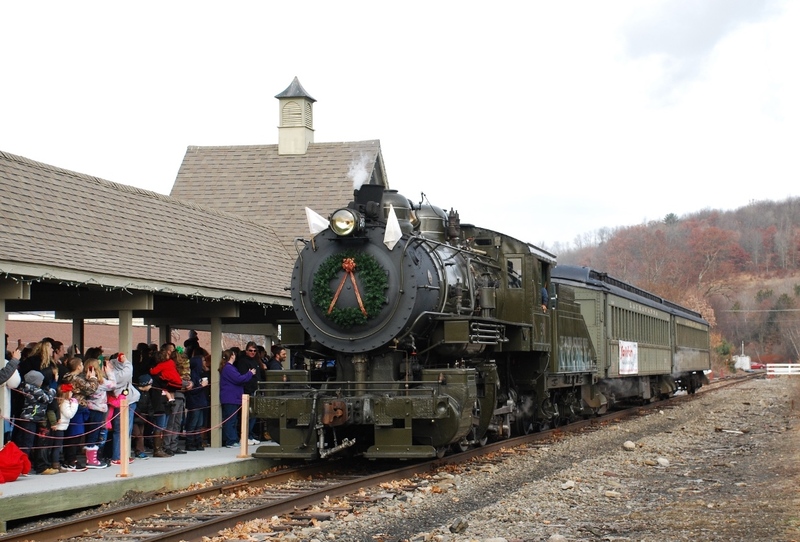 Lackawanna Heritage Valley's "Santa Train"
Saturday marked the twenty-first year that the Lackawanna Heritage Valley National and State Heritage Area have combined their efforts to hold the annual Christmas in a Small Town celebration. Carbondale, Archbald, Jessup, Olyphant and Dickson City were the towns the "Santa Train" made scheduled stops in. Upon the train's arrival in Archbald it was interesting to see a majority of the people holding up their arm to record the train's arrival with their cell phones. It made me wonder if people standing in the back got a video of the arms of people standing in front of them? Motive power was Steamtown's #26, Baldwin Locomotive Works 0-6-0, with two Lackawanna coaches. The attached photos were taken in Archbald as the train arrived and in Olyphant as the train was departing for its next stop which was Dickson City. Join GPCo to Support a Good Cause! Every holiday season, The Garbely Publishing Company's staff volunteers to support the U.S. Marine Corps Toys for Tots Foundation, which collects toys for redistribution to local, less fortunate children. GPCo is honored to be a part of Operation Toy Train, a conglomerate organization that is operating its 9th annual train across northern New Jersey and southern New York state, collecting donated toys along the way and delivering them to the Marines for redistribution to children along the train's route. 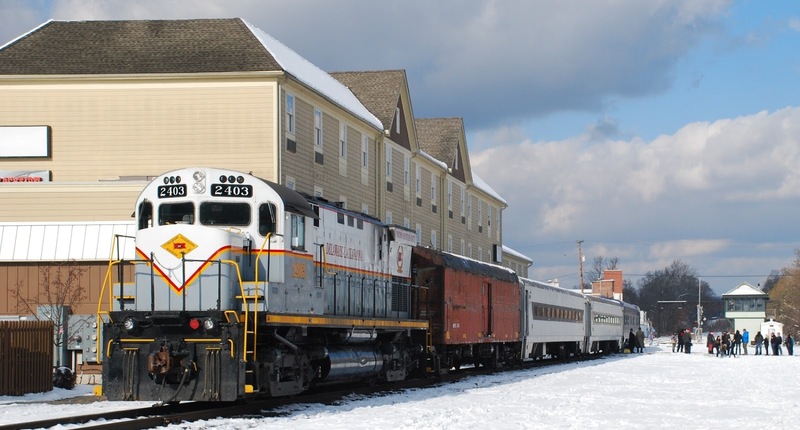 The train runs every year during the first two weekends of December, and collects over 20,000 toys across those four days. This event has helped build the Toys for Tots contingent at Picatinny Arsenal (Dover, NJ) into the third-largest Toys for Tots operation in the United States, which directly benefits children in the most heavily populated regions of northern New Jersey. This year, GPCo has stepped up its support of Operation Toy Train by volunteering time and donating financial resources to deliver a brand-new website to promote the train. Check it out at www.OperationToyTrain.org! To get involved, click here to check out the train schedule. Feel free to stop by any of the station stops, see the historic railcars, and donate new toys to a great cause. And, bring your kids to meet Santa, without waiting in line at the mall! Thanks in advance for the support, and hopefully we'll see some of you this weekend! If you have any questions, or if you'd like to contribute to Operation Toy Train or the Toys for Tots Foundation financially, please contact Rudy Garbely directly at rgarbely@operationtoytrain.org or at 973-800-9251. Copyright ©2017 by The Garbely Publishing Company. All Rights Reserved. 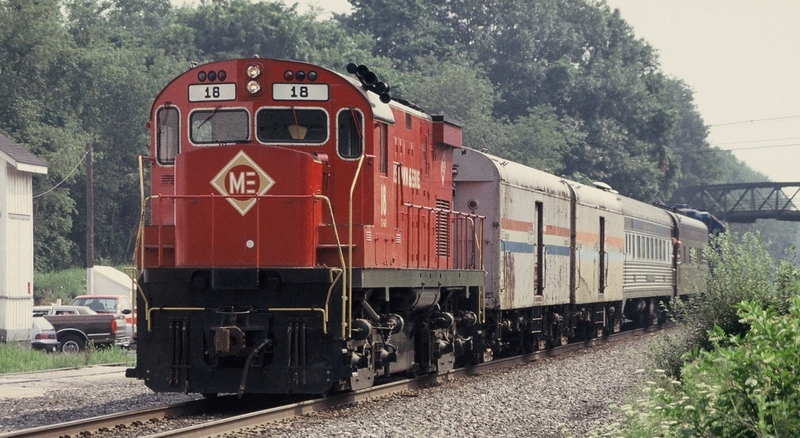 M&E's #18 travels east over the Lehigh Line! Back in August of 1994 I was up around Bloomsbury along CR's Lehigh Line when I heard a CR train, symbol SPL-101, coming east. My curiosity sparked by this unusual symbol I waited to see what this train was. 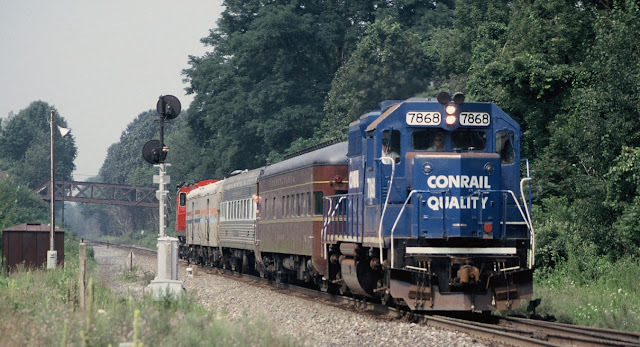 Leading the consist was CR 7868 as seen in the first photo passing by the since removed block signal at Lehigh Line MP 68.8 in Bloomsbury (NJ). The second image shows M&E's # 18 bringing up the rear as it passes by the former Agway farm products business in Bloomsbury, now known as F.S. Growmark. SPL-101 would then take the siding at West Portal and wait on a west bound power move down around CP Pattenburg before proceeding east.